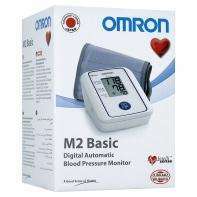 Omron M2 basic Blood Pressure Monitor - showing at £10 online(plus postage) on Asda,com but also available for the same price in store. This is a great product and a really useful tool for monitoring your own blood pressure.At £10 it is a bargain. The Omron M2 has great reviews and a useful product for some people. It is easy to use and has a simple one button operation and a Large, clear LCD display. Good accurate basic machine. But do remember the cuff size is limited to a maximum of 32cm circumference. So measure the circumference of your upper arm first. Overweight or larger people should consider another machine or buy a replacement larger cuff. been this price for months instore. they use this machine at the local asda so just got for free checkup and see if it fits plus get some free advice. I bought one two days ago. Omron is one of the best names in medical equipments. The cuff size is medium I agree. Batteries were included. Might be good if you want to keep an eye on your blood pressure if you have hypertension or taking a medication that can raise the blood pressure as a side effect. I bought it because my wife is in the second category. 32cm circumference? Does it work only on the upper arm or would the wrist do? 32cm circumference? Does it work only on the upper arm or would the wrist … 32cm circumference? Does it work only on the upper arm or would the wrist do? Its good for your average joe who thinks they are living a balanced life. Most of us will have higher than usual blood pressure. Product unavailable - exactly the same as the last time this deal was posted. tonnes in store.. big display unit out the front promoting them for £10. Just grabbed one in Canterbury.. great deal so thank you OP and previous posters. Yes I agree, it is still available at £10 at my local Asda as well.......how do i unexpire this deal??? There are wrist ones available for the same sort of money and holding your wrist level with your heart is exactly what you do. I've got one and it's much more convenient for using on your own and readings are accurate when compared to my quacks medical grade upper arm one. There are wrist ones available for the same sort of money and holding … There are wrist ones available for the same sort of money and holding your wrist level with your heart is exactly what you do. British Home Stores! Who is going to take medical advice from Sir Philip Green? Disclaimer: For those that miss the point BHS also stands for "British Hypertension Society"
I bought mine from perry Barr branch about two months ago. The stock doesn't seem to be goingdown. Plenty in stock in Frome store. Purchased thanks. Its always been £10 with the exception of being £24 for a few weeks then bak to £10. Dont know how they do it as my friend works in a chemist and says they buy them in at £17. £15.50 on Amazon, £29.99 at Superdrug and the Boots branded version is £30.60, which, by the way, is the cheapest upper arm monitor they sell. So, smartarse, they're not really "£10 everywhere", are they? Bought one of these last month at this price, great value. The pharmacist reckoned that Omron would swap the cuff for a larger one at no additional cost, if required. Voted hot! Fair enough, but their only criticism seems to be based on people either not reading the instructions or unaware where their heart is! Definitely easier to use. Thanks. I was looking for a decent cheap monitor. Got one from Barrow-in-Furness today. Said £20 on shelf sticker but scanned at £10. Thanks!